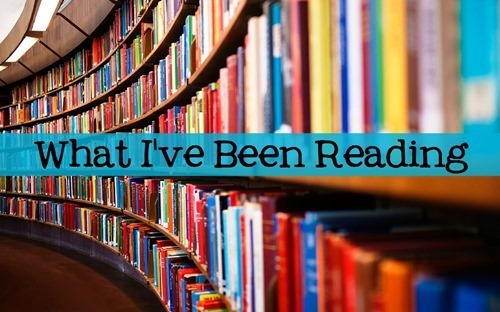 It’s been a few weeks since I last shared what I’ve been reading, so I have a few books to talk about today! First up is the sequel to Wait For The Rain, which I reviewed last time. Bridges by Maria Murnane was sent to me by the author in exchange for my review. It continues Daphne’s story as she and KC head to New York City to celebrate Skylar’s engagement. I read this before my recent trip to New York City and thought it was so funny that the High Line was mentioned, as that is one of the places I visited on my trip and I hadn’t heard of it before arranging to stay close to it! I really love the friendship between these three. The funny thing is that since they don’t see each other often they tend to hold back from one another, but when they let the others in, they are so supportive and caring and it makes you wonder why they kept secrets in the first place. The New York City setting was fun and enjoyable, as were the surprises about each of the characters! Next, I had run out of books (how does that happen?) so I borrowed one from Gabbie. Now by Morris Gleitzman is part of a series, but can be read on it’s own. It is meant for grades 5 – 9 and focuses on Felix, a Holocaust survivor, and his granddaughter Zelda, who tells the story. They live in Australia. It seems that of the series, this is the only one that does not take place during the Holocaust itself. Felix is a wonderful grandfather and Zelda is a caring granddaughter. Together, they make an admirable pair. I would definitely read the other books in this series about Felix as a child, but this does stand alone as the events in it are separate from the past. Next up, I read Before I Knew by Jamie Beck. I was sent this book by PR by the Book in exchange for my review. The first book in a new series about family, friendship, and starting over, Before I Knew features Colby Cabot-Baxter as an appealingly strong woman character who had been through a lot. Her family members are featured in the story and I imagine the future books in the series will focus on her siblings. The fact that Colby’s husband killed himself and had suffered from mental illness was something I had not previously read about in a novel. I appreciated the author’s willingness to feature these issues as well as the stigma that surrounds mental illness. Colby’s eventual ability to confide in her family is a turning point in her ability to move forward with her life. I also enjoyed the complicated history between Colby, Alec, and their two separate families. Aside from being a romance, this book is also a story of friendship, love, and personal growth. I finally got my hands on a book by Colleen Hoover after wanting to read her books for years! November 9 is interesting because it takes place only on November 9 over the course of many years. I don’t want to spoil too much of the story that isn’t revealed in the summary. It seems throughout the book that you learn a lot more about Fallon than about Ben, but towards the end, his story and the ways it intertwines with hers becomes clear. I liked both characters a lot and enjoyed their personalities and the ways they interacted with each other. Focusing on only one day of their lives each year eliminated reading about a lot of the angst that could have occurred in between, but also served to prolong their relationship really moving forward. As a plot device, it was unique and worked for me! Last year, I read Everything We Keep by Kerry Lonsdale and reviewed it on my blog. Now, I was asked to review the sequel, Everything We Left Behind, and I loved it just as much. Everything We Left Behind focuses on the story of James, the man who went missing in the previous book. With his memories recovered up to the time before his accident, James struggles to remember what caused his memory loss in the first place as well as the past 7 years he spent living as another man. Like in the first book in the series, there were a lot of unexpected twists in the story. I will say that I was expecting a bigger twist towards the very end and it surprised me that it wasn’t there. The ending also did not make it obvious as to what the next book in the series will be about. If I had to guess, I would think it will be about James’s mom, who was a big part of this book but still relatively a mystery. Dissociative fugue as it is used in the story is interesting. James awoke with no memory of who he was and redeveloped himself as Carlos. Then, he regained himself as James, but forgot all of Carlos’s memories. This memory loss was obviously quite disruptive, but as Carlos kept detailed journals, James was able to see most of what he had seen as Carlos. The book is told in the alternating view points of Carlos in the past and James in the present. It seems that the ultimate recovery of all of the repressed memories would be the way James could heal. While he does come to remember things he had repressed, what he needs to do is combine his two identities – Carlos and James – into one man, which it seems he is eventually able to do. As a follow up to Everything We Keep, this book is excellent, and I think it can be read as a stand alone as well. I would definitely recommend reading Everything We Keep now, and grabbing Everything We Left Behind when it is released on July 4! Have you read any of these books? What have you been reading lately?